Ed is a partner in the Corporate department. Described as “Reliable, accurate, efficient and prompt… a pleasure to work with” by a current client, Ed’s specialisms include mergers & acquisitions, corporate finance, buy-outs, joint ventures, corporate structuring and alternative fundraising structures. He has a number of clients in the financial services, IT, renewable energy and healthcare sectors, and also acts on mergers and acquisitions of advisory and professional practices. 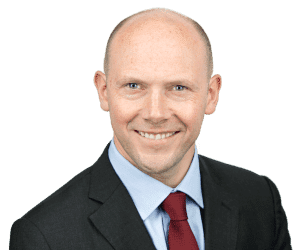 Ed has a particular specialism in financial services and advises in connection with consumer credit legislation and the Financial Services and Markets Act. Ed joined Clarke Willmott in July 2012 from corporate boutique Lockett Loveday McMahon. Acting for the sellers of a leading cyber-security provider to a national internet service provider. The acquisition by a UK manufacturer of sporting goods of a German distributor. MBO of a London-based props hire business. Acquisition of a leading brand in automotive retail. Acting for the vendors of several insurance broking groups to a UK plc. Acting on a joint venture between a clinicians’ corporate vehicle and a commercial healthcare provider to the NHS. Mergers and acquisitions of several special purpose vehicles holding renewable energy assets. Acting for management on the £9.5 million management buy-out of an events management and marketing group. Acting for a North West engineering group on a series of acquisitions. Advising on the disposal of a claimant law firm to a private-equity backed financial services group. Advising on the cross-border disposal of a franchised health supplement distributor to a US buyer. Advising on initial and further investment rounds for an IT and data provider to the insurance industry. Acting on the acquisitions or disposals of various wealth management and financial advisory firms.